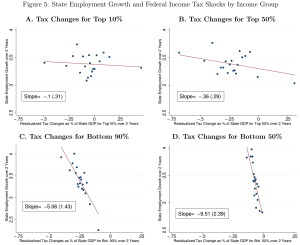 Do tax cuts targeted at different parts of the income distribution produce different effects in terms of employment growth? This is the question addressed in a new NBER paper by Owen Zidar, an economist at Chicago (not known historically for progressive analysis). But the paper (ungated version; and slides) has had a good deal of US media coverage, largely because of the progressive tax implications. 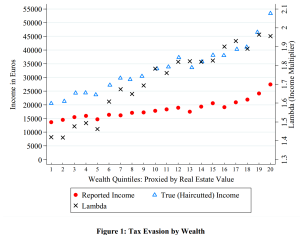 The main innovation of the paper is to overcome the scarcity of time series data by exploit US data on state-level income distributions, which differ widely, in order to view each state-year response to a national tax policy change as a separate observation. The main result is not, intuitively, surprising: but it is not a question that has been commonly posed, nor this well answered before. 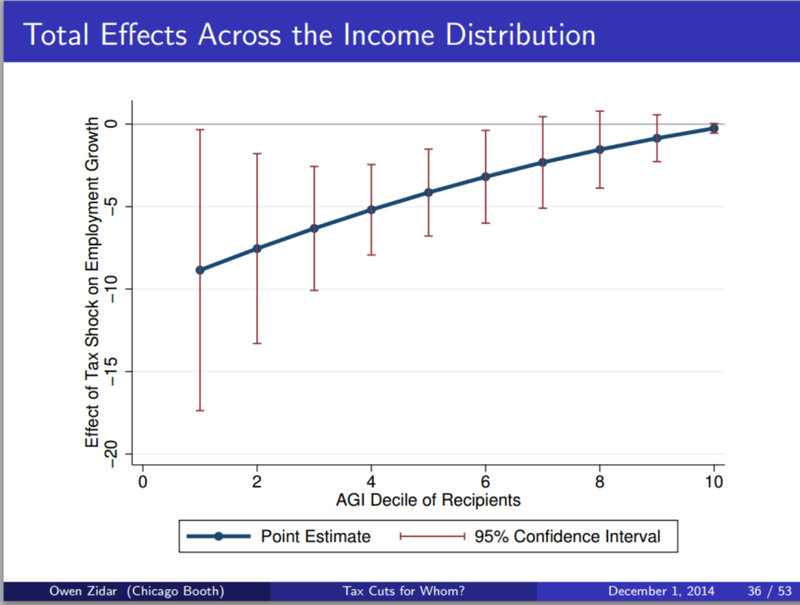 The result is that tax cuts are least likely to generate benefits when targeted to the top 10% of households; and most likely to generate benefits when targeted to the bottom 90% – or as in figure 5, the bottom 50%. 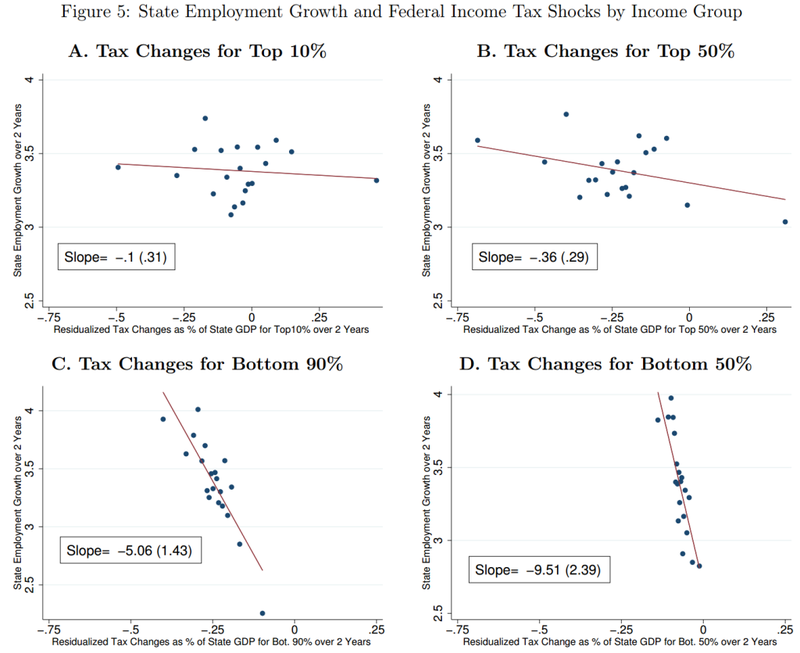 Overall, tax cuts for the bottom 90% tend to result in more output, employment, consumption and investment growth than equivalently sized cuts for the top 10% over a business cycle frequency. 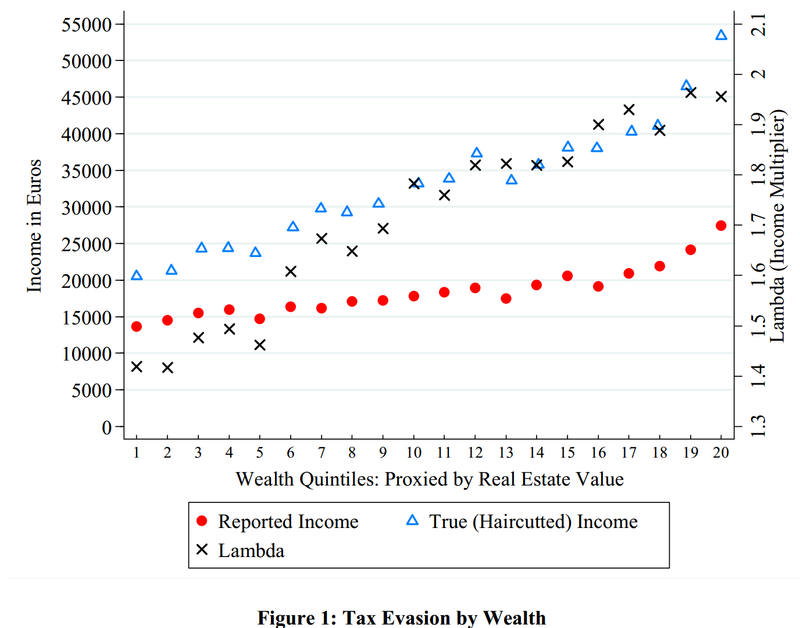 progressive taxation is bad for growth, and ultimately bad for the poor as well as the rich. One fairly clear implication of the findings is: the opposite. 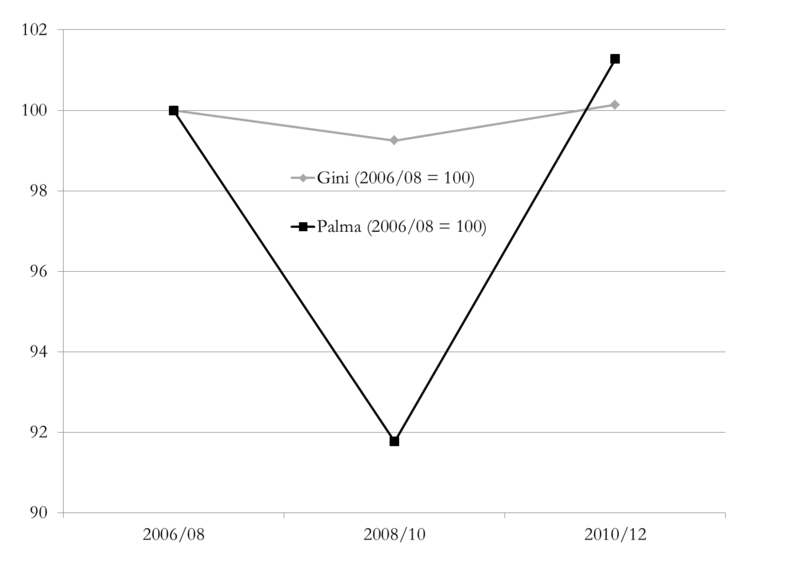 The employment growth impact of a tax change for the top 10% is impossible to distinguish from zero, so it follows that a revenue-neutral change in tax structure that deliberately reduces the Palma measure of inequality (that is, the ratio of incomes of the top 10% to the bottom 40%) will not only be progressive but will have the effect of increasing employment growth. 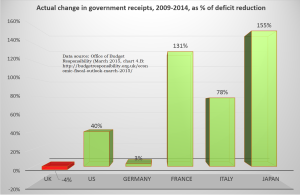 The UK is the only leading economy which didn’t split its deficit reduction between spending cuts and tax rises. 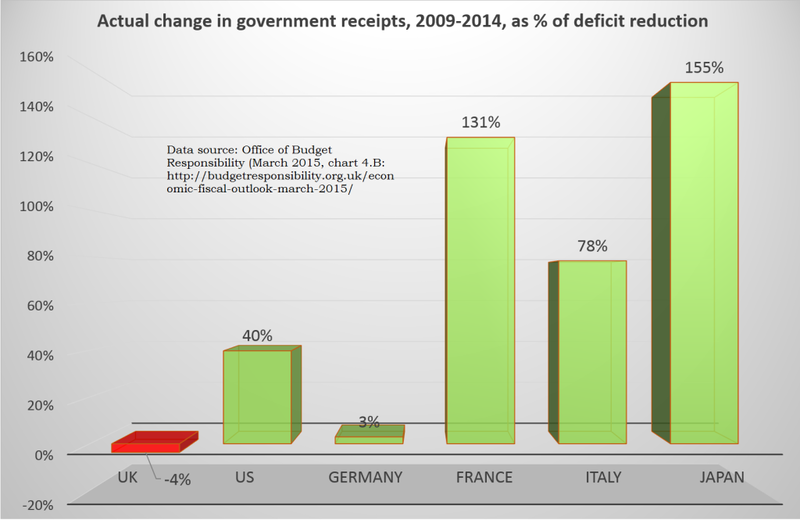 To put that another way, the UK is alone in having imposed spending cuts larger than the deficit reduction it achieved, because receipts actually fell. So the UK’s austerity has been particularly tax-averse. 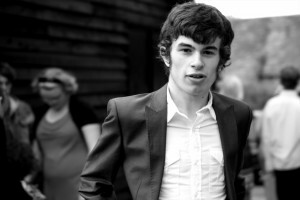 Does it matter? There’s a lot of detail hidden under this headline number, including the broad shift away from direct taxation. Corporate tax cuts, in particular, have reduced those revenues by more than 20%. 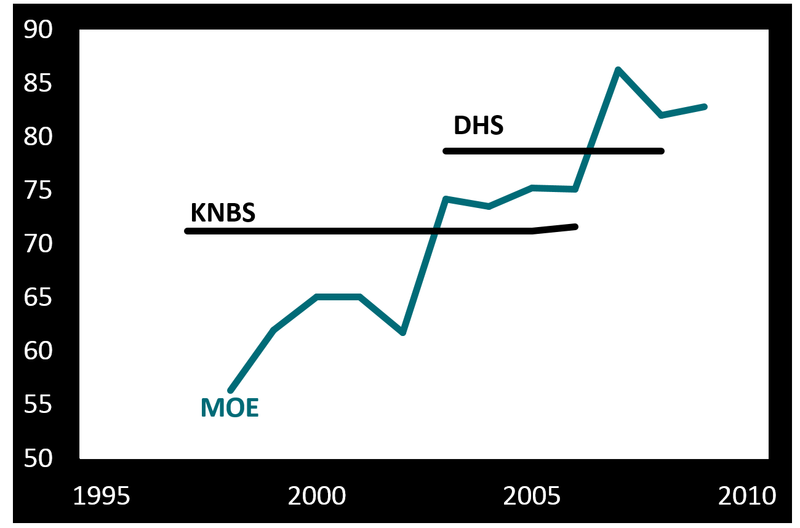 While spending cuts and tax rises can both be regressive, you expect in general that spending cuts affect lower-income households more; while tax rises would affect higher-income households more. 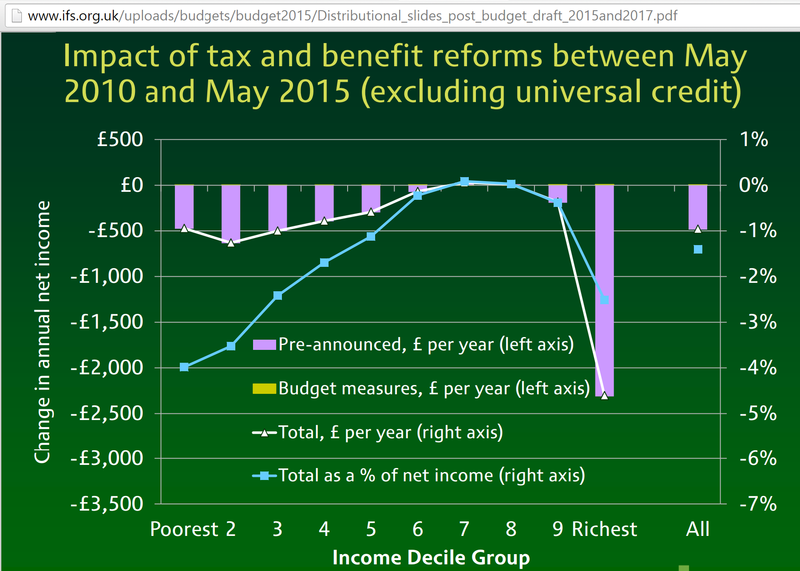 All else being equal, you’d expect a relatively extreme tax-averse austerity to have a regressive impact. And, by and large, this is what the data show. 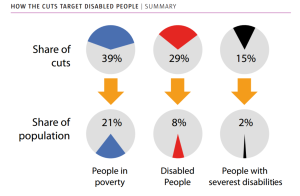 The Institute for Fiscal Studies find that the ‘biggest losers’ are the bottom half of the distribution, due to cuts in social security for those of working age, and the top decile (due to tax rises – a finding that is much stronger when the tax rises of the previous Labour government are included in the analysis). 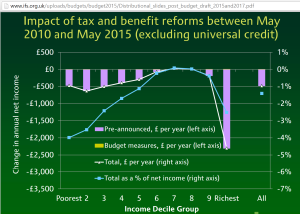 The blue line in the IFS figure (using the right-hand axis) shows the rather greater relative losses of the bottom 40% compared to the top 10%. 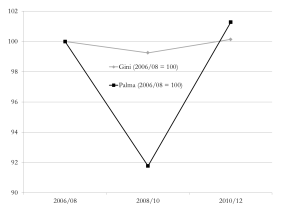 [Consider the Palma ratio of inequality to see why these groups are especially significant.] 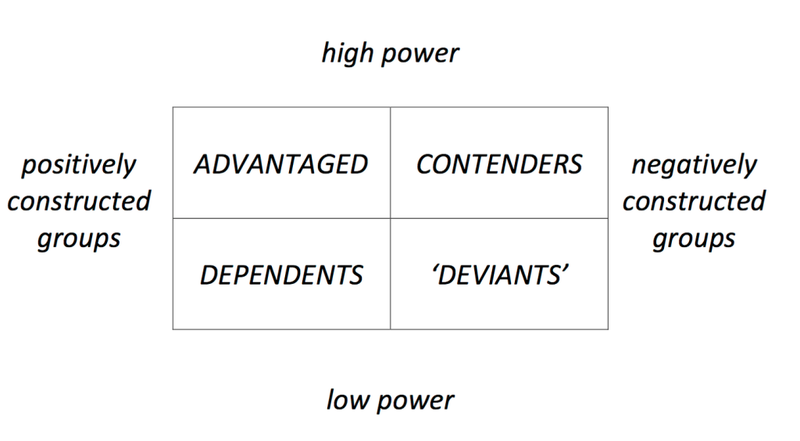 The bottom quintile in particular is hardest hit – and inevitably much less able to assimilate a few percent loss than would be the top decile. It’s not clear whether policymakers or opposition parties are aware of, never mind engaged with, the relatively extreme tax-averse nature of UK austerity. This is probably in part because the sharp inequality fall from 2008-2011 due to the crisis, rather than (changes in) policy, has allowed the current government to pursue a relatively regressive approach while still claiming progressive impact. 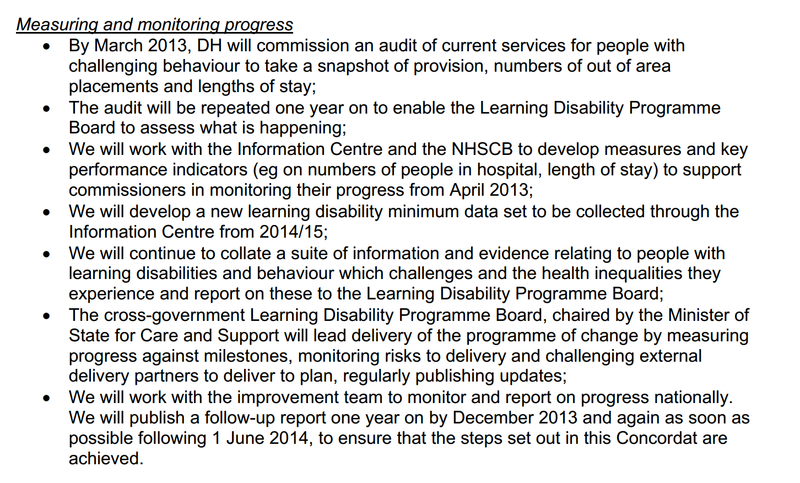 It’s disappointing though to see the lack of scrutiny of, or public justification for, such an approach. Since the financial crisis, rather more attention has been given to arguments about the potential inequality impact of the financial sector (it was a major part of this Columbia conference in December, for example). One argument is that bigger financial sectors give rise to lower inequality, because financial development, to quote a World Bank study,“disproportionately boosts incomes of the poorest”. Alternative views are more in tune with TJN authors’ proposal of a ‘finance curse’, through which a larger financial sector undermines democratic processes and more. An interesting new paper from the Spanish bank BBVA takes a look at the main indicators, and finds – broadly – that the size of the financial sector is at best neutral for inequality; while it is a set of financial inclusion measures that are associated with lower income inequality. 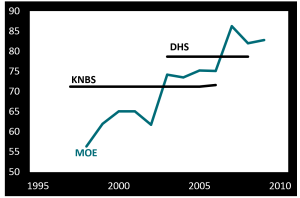 The proportion of adults with a bank account, and the ratio of SME loans to GDP, emerge as especially important. Separately, Tony Atkinson and Salvatore Morelli provide the most comprehensive overview to date on the relationships between inequality and banking crises over a century or more. ‘More evidence needed’, and ‘no single story’ are major elements of their conclusions – but long-lasting human impacts are to be expected.